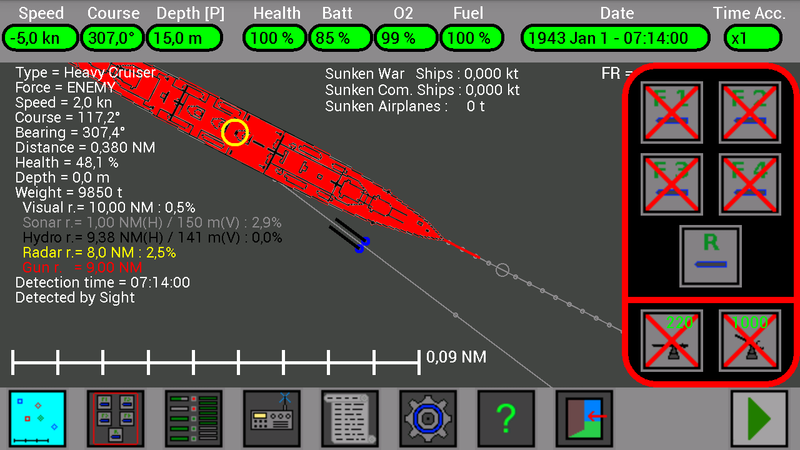 In this example I will launch some torpedoes against a Heavy Cruiser, who is coming toward my U-Boat. A big warship is coming near, its symbol is gray, I don’t know if it is enemy. I select it to check its information, it is a Heavy Cruiser and it has a gun (look at the red circle, it is the range of its gun), so it is better to remain at periscope depth, to avoid to be hit by his gun… My U-Boat is inside the radar range of this warship (look at the yellow circle), and the warship has a little probability (2.5%) to detect my periscope with its radar (look at its radar range : 8 NM with 2.5% of probability to detect my U-Boat). 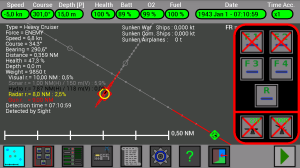 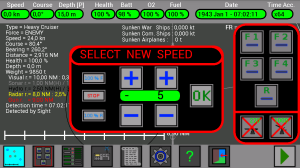 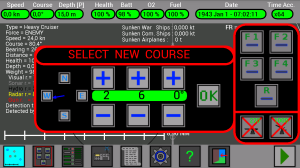 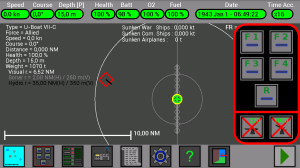 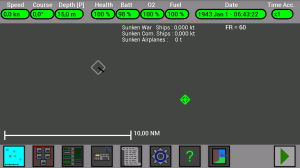 I press now the second button in the lower bar to open the Torpedoes Launch windows, I look at the gray lines for a better understanding of the warship course. For the moment I am not inside its hydrophones and sonar range (black and gray circle). I select my U-Boat to check my visual range (white circle), the warship is inside this range, infact after some time I can identify it as ENEMY. 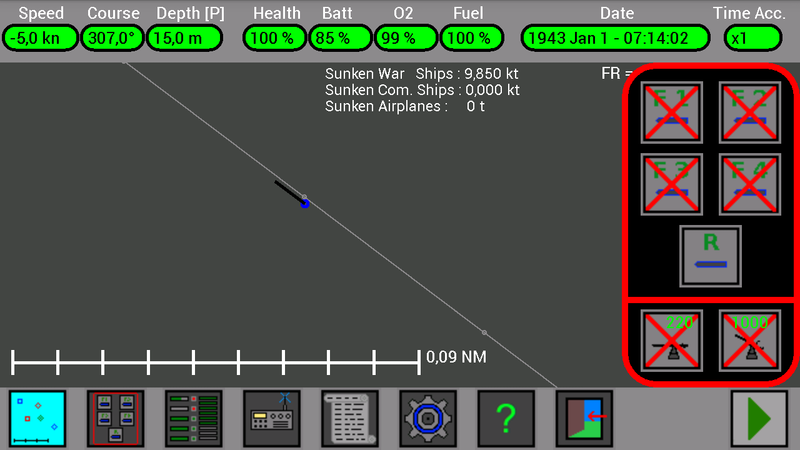 The warship is coming near, it should soon detect my U-Boat with its radar, I wait. I was detected by the warship, it is coming toward my U-Boat at great speed ! I can do two things : escape ot attack it… It is very fast (24 kn) and has a gun… if I go at surface I could use my max speed (18 kn), but the warship is faster… and my gun can not hit a ship behind me… if I go at a greater depth to avoid its depth charges, my max speed would be 8 kn, and it is near… I will attack it ! First, I will turn my U-Boat to have the warship in front of me. 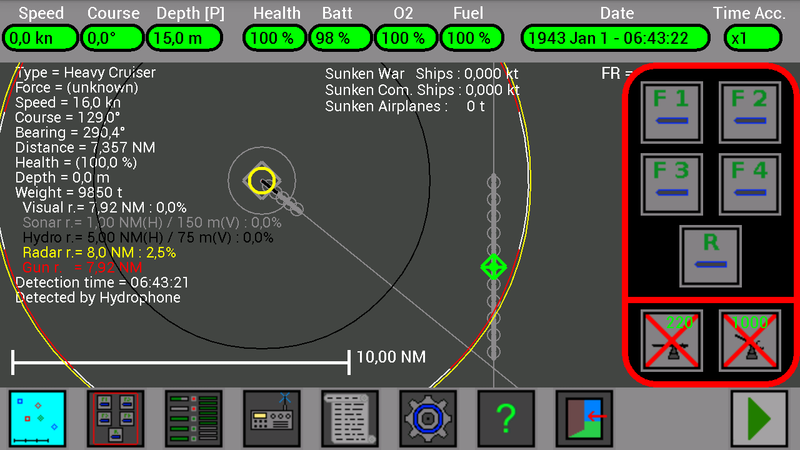 Looking at its information, I see that its bearing is 260.2°, I will use this number for my course. Second, I will try to have more time as possible before it meet me, for a possible escape maneuver, so I will set for my U-Boat the max backwards speed (-5 kn). I set my new course to 260° to have the warship in front of me. 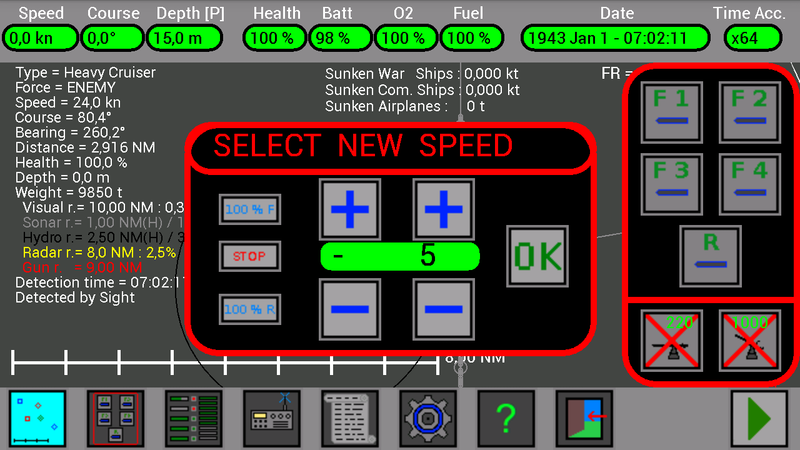 I set for the new speed my max backwards speed (-5 kn). My U-Boat is moving backwards and turning. While I am waiting, its bearing increases to 261°, I adjust my course to 261°. 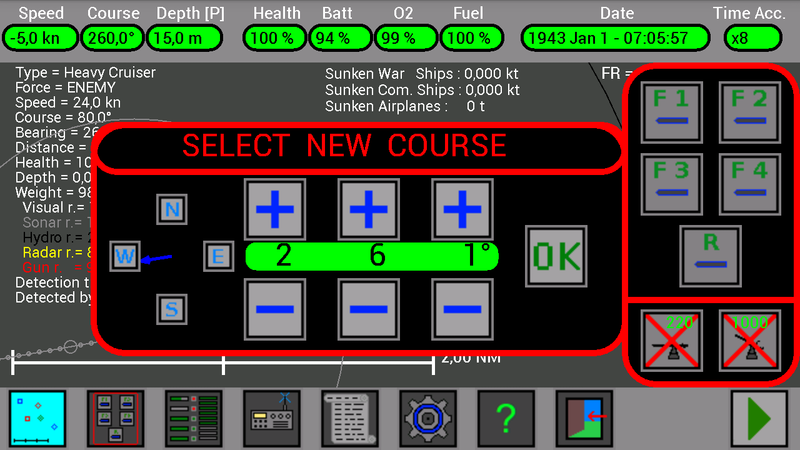 My new course will be 261°. The warship adjusted its course, the gray lines coincide ! Now that it is near, I notice that its probability to detect with its sonar my U-Boat is increased to 1.4%… probably it will detect also my torpedoes… I want to wait before launching my torpedoes, to not give the warship the time to avoid them ! But at the same time, I must be sure that my torpedoes have the time to activate… there are 2 red lines, one in front of the warship and one in front of my U-Boat… I must launch my torpedoes before the two red lines meet, or when the torpedoes will hit the ship, they will be still inactive and will not explode ! 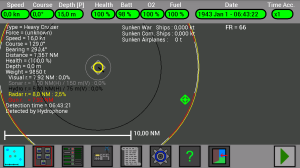 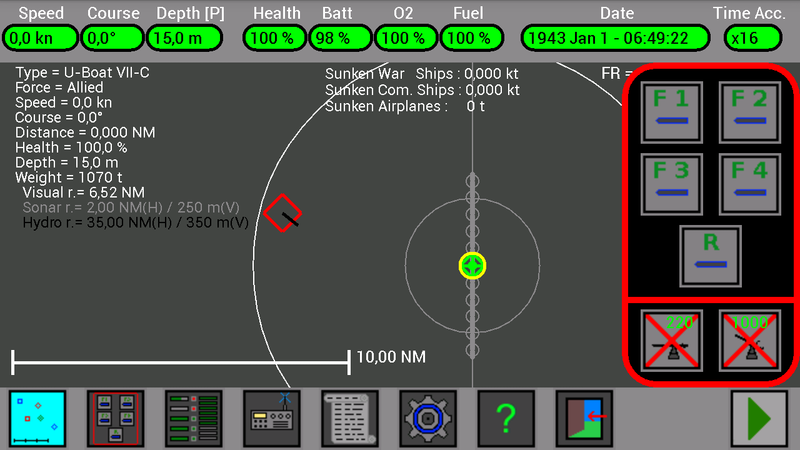 Now the warship is at 0.5 NM, a good distance, I zoom in to check if my gray line passes in the center of the warship. 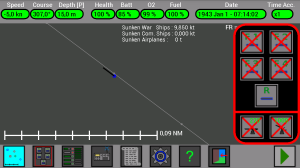 Perfect, my gray line passes in the center of the warship, the torpedoes will hit it. I launch 2 torpedoes from tube F1 and F2. Good, one torpedoes hit the ship, its health now is 47.2%. The warship is damaged and its speed will decrease. 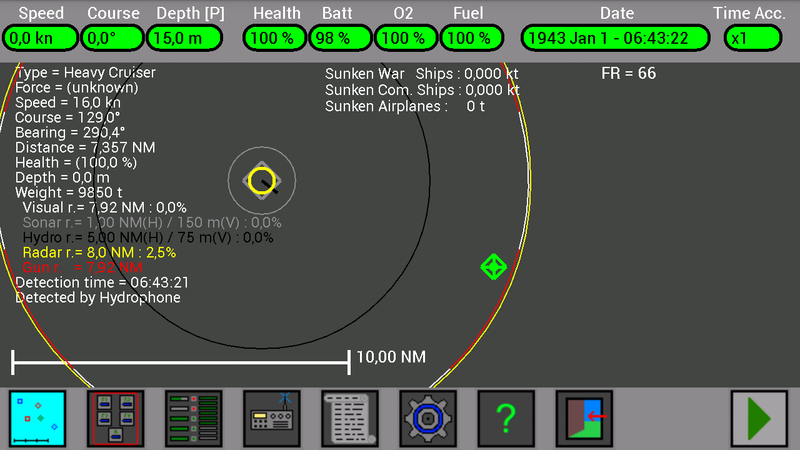 I change my route to be ready for an other launch. 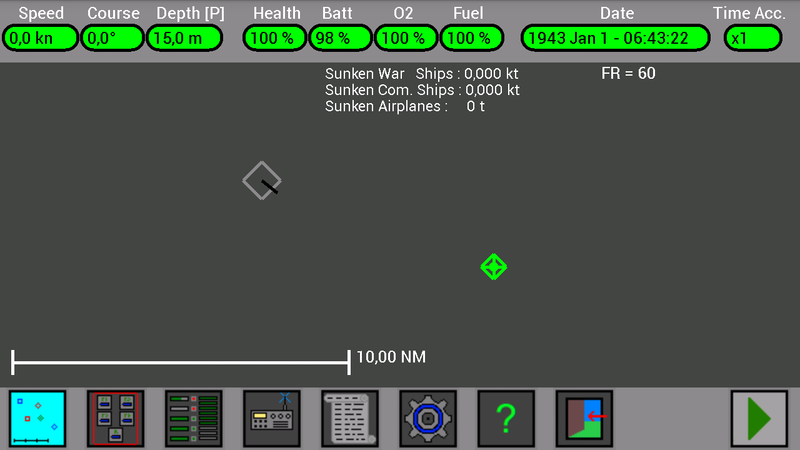 The damaged warship now is slow (6 kn) and is turning toward me. Now it is the moment to launch two other torpedoes ! The warship is trying to avoid them, but now it is too slow ! Perfect launch, both torpedoes will hit the ship ! The first torpedo sunk the warship ! !